When it’s time for you to get a replacement garage door in Milwaukee, you have many options. If you’re looking for unmatched durability, easy maintenance, beauty and energy efficiency, steel garage doors are the best option for you. There’s no option more durable than a steel garage door. They’re made to be resistant to rain, snow, hail and wind. This is because they’re made from a 24-gauge steel that won’t dent and ding when it’s struck. It’s perfect for homeowners in Milwaukee who have to deal with erratic weather throughout the year. Steel garage doors are much easier to maintain than their aluminum and wood counterparts. Aluminum garage doors dent and scratch easily which poses a problem when dealing with the weather or children at play. Wood garage doors may look pretty but they’re full of problems. They warp and rot when exposed to moisture which will require a lot of maintenance. Not to mention that wood garage doors need to be painted and stained every few years to maintain their looks. Steel garage doors don’t have any of these problems. All you need to do is clean them every once in a while and they’ll look great for decades. One of the great things about steel garage door is that they’re very customizable so you can create the perfect garage door for your home. There are many color options available (including wood grain finishes). This allows you to make a garage door that fits perfectly with your home. Not only are there many colors, but there are tons of hardware options as well. You can even get window inserts for your garage door to enhance your home’s curb appeal and allow more natural light into your garage. Feldco offers steel garage doors that are foam insulated for great energy efficiency. What this means is that drafts won’t be able to pass through your garage door and get into your home. 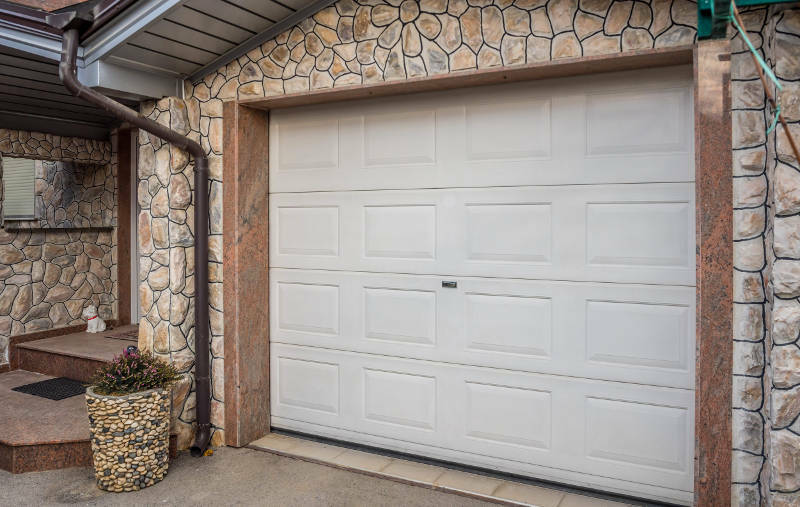 Your house will feel more comfortable year round, especially rooms that share walls with your garage. Comfortable is great but it’s not the most important reason you want an energy efficient garage door. It’ll also save you money on your energy bills. By keeping the outside temperatures out, your furnace and air conditioner will use less power to heat and cool your home. That means your energy bills will be significantly lower thanks to your steel garage door. If you don’t choose a great company in Milwaukee, it doesn’t matter what your garage door says it can do. You want a company that has the experience and quality product to ensure that you’re getting the best steel garage door available. Your search has ended with Feldco. We’ve been serving the Midwest for over 40 years and our 350,000+ happy customers can assure you that about the quality of our garage doors. Not only that, but all of our products are installed by factory trained and certified professionals. You know you’re in good hands with Feldco. Get a free quote to get started on your replacement garge door project today.